I am simultaneously excited and disappointed in myself - for I have been unable to snub MAC! I, like many, waited and pined for Whisper of Gilt to return as a stand-alone product, unimpinged by an alien half. And here it is, albeit reduced from 9g to 7.5g, in a beautiful frozen glass effect compact. I vowed that by now, there were many Whisper of Gilt clones, and MAC had missed its chance. But the flesh is weak, I have succumbed. 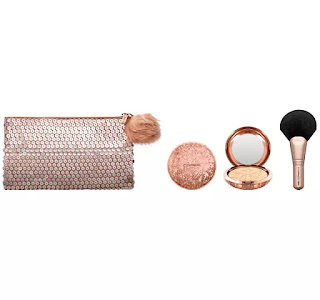 It's £35 and comes with a rather tacky bag and a synthetic short handled brush. I've heard that MAC are discontinuing their natural hair brushes and will be moving to all synthetic soon; not sure if this is true. Anyway... If you want it, it's online NOW! I really hope it's as amazing as I remember... with a wonderful peachy pink flare within... We shall see. I'll update with thoughts.